In mid-October, a few short hours after posting about Kathy’s tomato sauce, I went into labor. We watched a couple of Modern Family reruns and maybe part of a Bruins game? I’m not really sure. Basically, we waited around until I couldn’t talk during contractions, then Doug and I headed to the hospital. Between contractions, Doug joked about how unprepared we were as compared to the first time around. Six years ago, we showed up at the hospital with a suitcase I’d packed three weeks in advance, a yoga ball, my ergonomic pillow and a portable speaker for my *laboring playlist*. Our freezer at home was packed with enough food to last us two months. This time, I remembered to bring an outfit for the baby but forgot my own clothes. I left a note for my mom, asking her to order pizza for the big kids because there was no other food in the house. I tried to forget how disorganized we were and focused on the task at hand. Labor was still painful the third time around, but I got to sit in a bed surrounded by my husband and several compassionate women, all willing to fetch ice, rub my back and feet, rearrange my pillows, tell jokes, and tell me how great I was. It was a dream come true! And almost (almost!) made me forget what was actually happening. 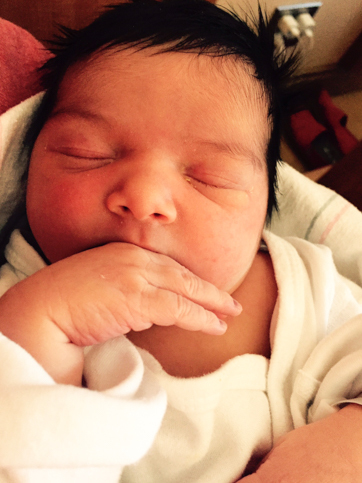 Early the following morning we met our newest addition, a baby GIRL! Weighing in at almost 8 and a half pounds, she had roly-poly thighs, round, pink cheeks, and a shock of black hair. We were fairly convinced she was going to be a he, so Baby Girl Deihl remained as such for a day and a half while we got to know her. We narrowed the list down to four names, then two, and finally settled on Louisa. Greek for “warrior,” Louisa sounds deceivingly feminine. An apt name, we thought, for the youngest of three. A wily fighter disguised as a pretty little thing. I relished the first few hours we had alone with her in the hospital, knowing that after this moment, she would never again be my baby. I’d never get to have her all to myself for hours on end like I did the first time around, what with two other little ones running around the house. I knew there was enough love in my heart to go around, but didn’t know how I’d manage the physical contact – snuggling and hugging and kissing – between car rides and activities. I worried there’d be nothing left for little Lulu. As if on cue, her brother and sister raced into the hospital room and crawled all over me looking for the baby, so eager to meet her. Jack checked out her belly then poked at mine, to make sure it had sized down, as promised. Right there in the hospital room he made me bend over and touch my toes, proof that I was heading back to normal. 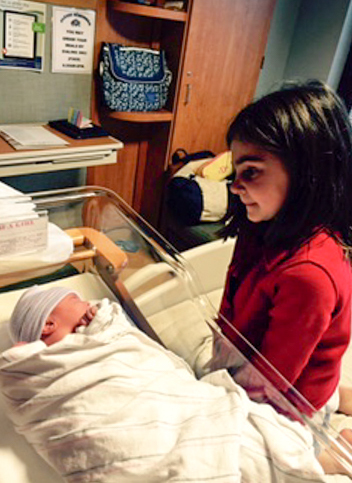 When we got home, Addie held the baby for hours, staring at her and cooing at her, coaxing her to open her eyes. Jack made me jog up and down the street with him, ride bikes, play catch, and, despite the meal delivery we’d received, demanded I make dinner – the last item on his mental checklist proving I was back to normal. 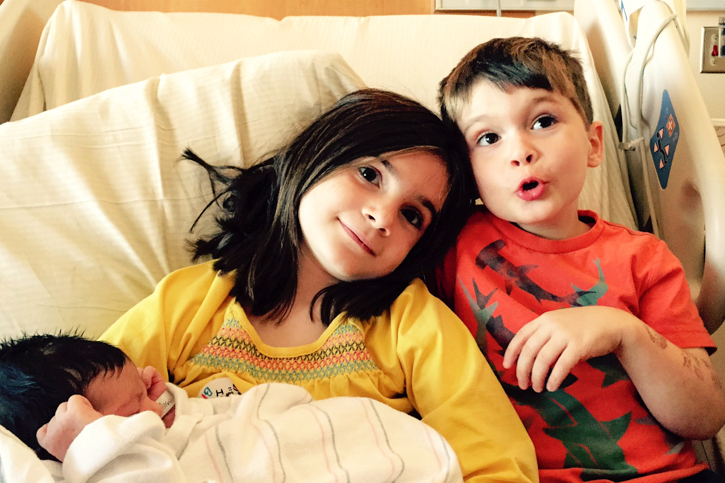 As would become the norm in the months to come, Addie held the baby, changed her diaper, and talked to her while and Jack flitted around, acting like a goofball and trying to make everyone laugh. 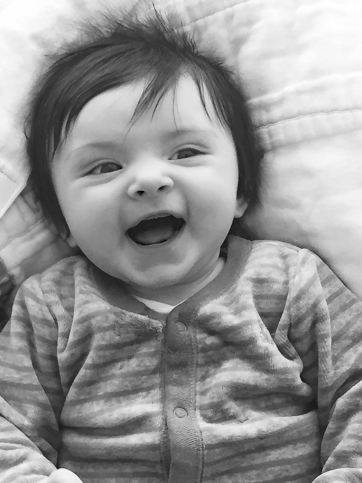 What I hadn’t banked on that morning in the hospital was how the rest of the family would fill in the gaps; Addie maternal and nurturing, and Jack, energetic, fun-loving, and sensitive. They were like miniature versions of Doug and me. In that moment, I was so grateful for the idea of family. It was no longer about how prepared I was and how well I could hold everything together on my own. We were doing it together. We were sometimes crazy, sometimes completely disorganized, sometimes loud as hell, and never really did anything exactly as I would have done it myself, but it wasn’t about me, it was about us; our family unit working together to keep the ball rolling. Everyone was looking out for one another in their own unique way. I can’t wait to see how our littlest warrior fits in. 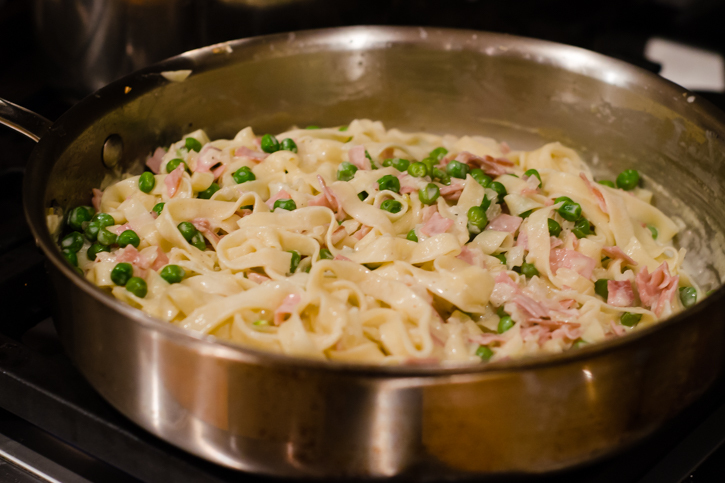 I did as I was told that night, assembling Tagliatelle with Ham and Peas, an old standby that I can practically make in my sleep, using ingredients we almost always have on hand even when I haven’t been to the store in over a week (increasingly the norm). 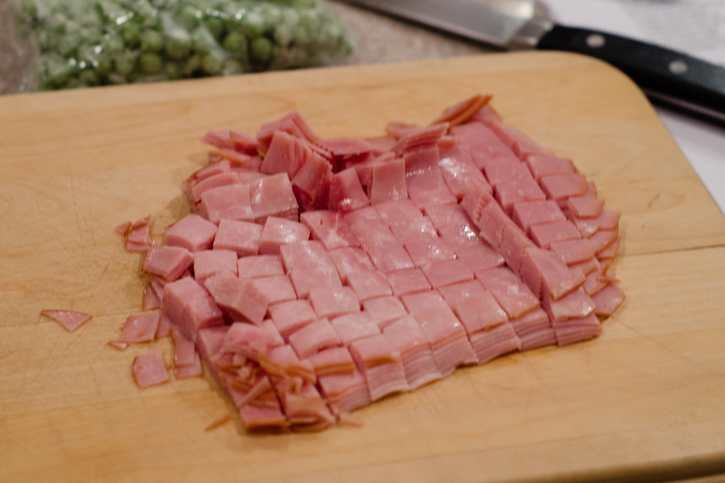 My mom has been making this dish for as long as I can remember and would always whip it up whenever someone needed comforting – after a breakup, a bad test score, or whenever we came home from college and yearned for a reminder of our childhood. 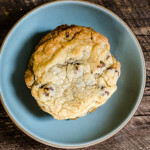 This is our bear hug in food form. When I finally measured out the ingredients and wrote them down, I realized the sauce is actually quite simple to make. 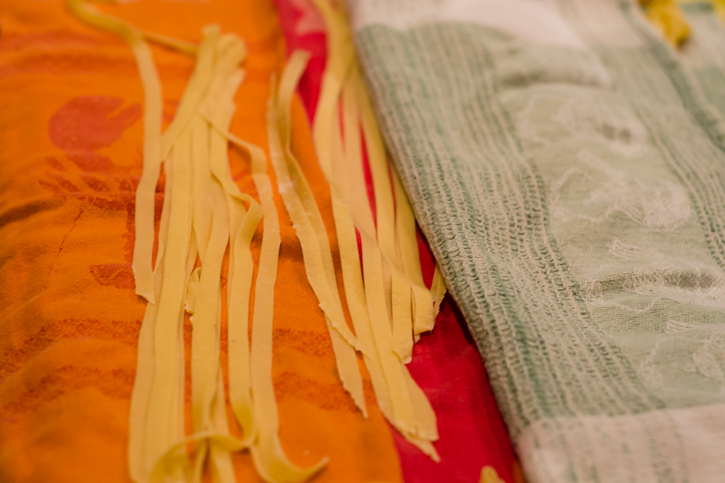 I made my own pasta one night when I realized, too late, that we didn’t have any of the supermarket variety on hand. The recipe works great with store-bought spaghetti or linguini, it’s always how we ate it growing up, but if you have a pasta maker and are so inclined, the hand made stuff really soaks up the sauce and creates an elegant, soul-satisfying dish. 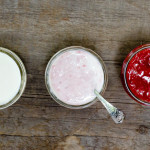 The sauce is creamy and salty, slightly sweet, and colorful. It hits all the right notes, great for family or company – whomever happens to be around. 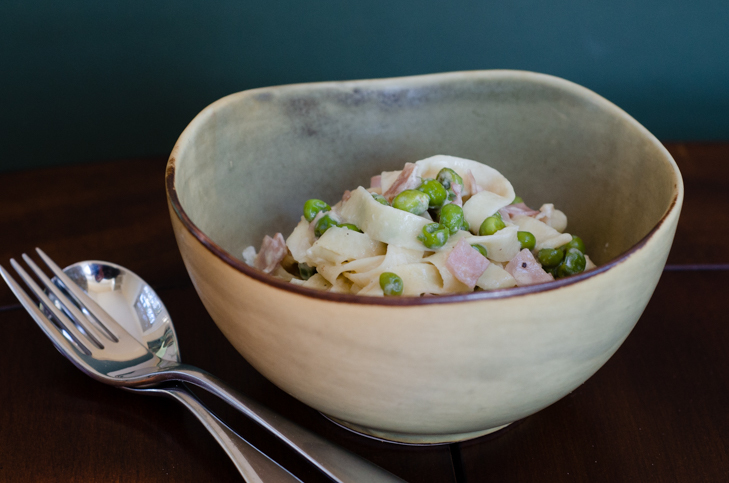 The recipe for the homemade tagliatelle hails from Marcella Hazan's The Essentials of Classic Italian Cooking, my go-to resource when I'm trying to think like an authentic Italian while decoding one of my mother/grandmother's vaguely written recipes. The sauce hails from my mom and before that, my grandmother. 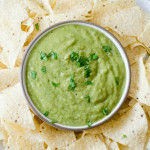 The recipe serves 6 as an appetizer, or 3 to 4 people as a main dish. 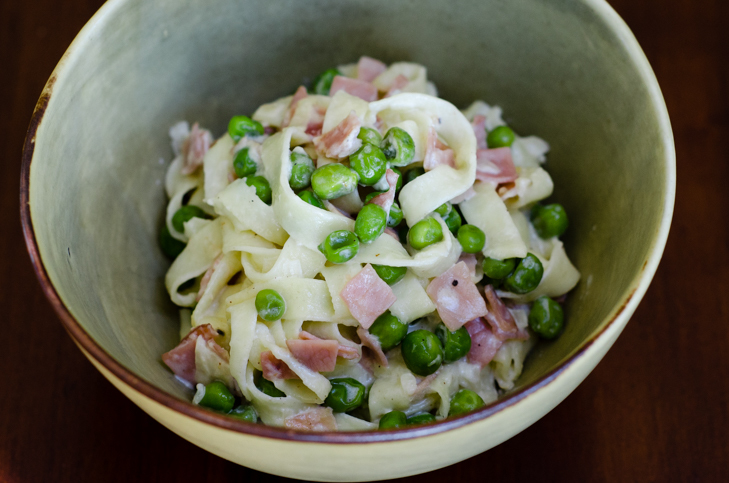 If using store-bought pasta, the dish comes together in 15 to 20 minutes for a quick and satisfying weeknight meal. 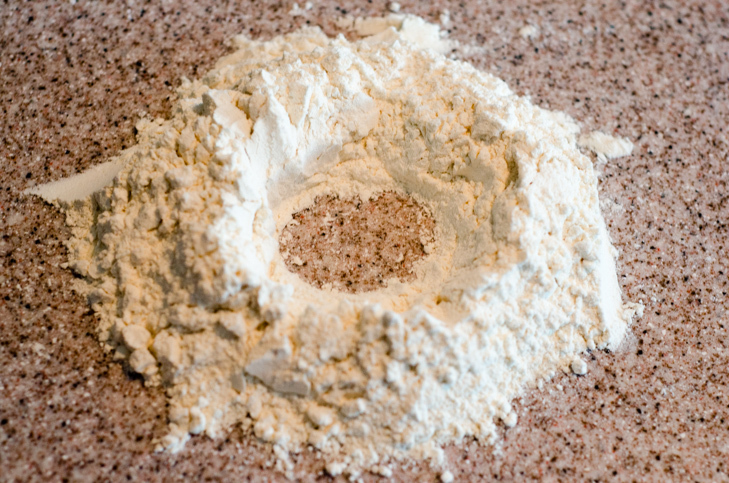 Mound the flour on a clean work surface and form a wide well in the center. Make sure the walls of the flour are high or the eggs will seep out. Crack two eggs into the center of the well and scramble lightly with a fork. 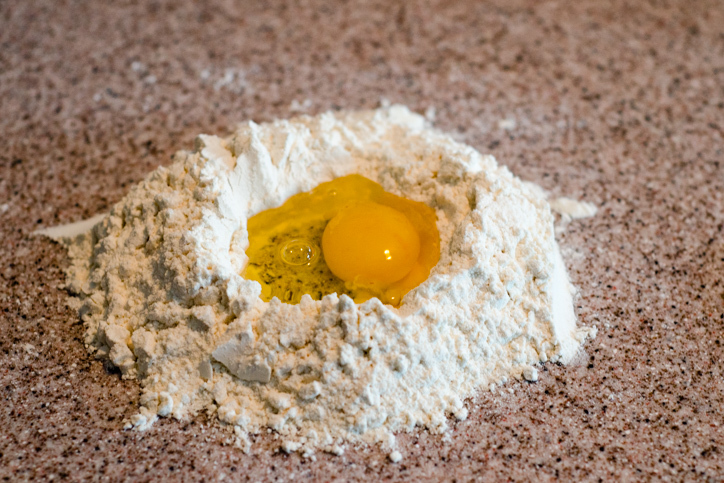 Working in a circular motion, pull some of the flour into the egg mixture, continuing to stir until all of the flour is incorporated. 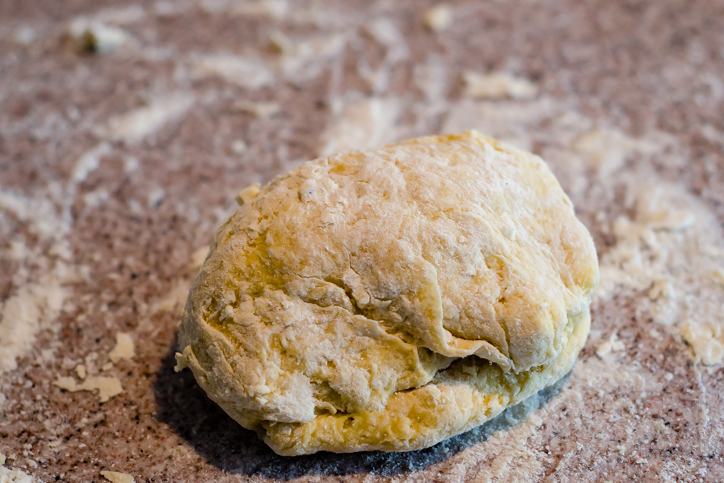 Form the dough into a ball and sprinkle some flour onto the work surface. 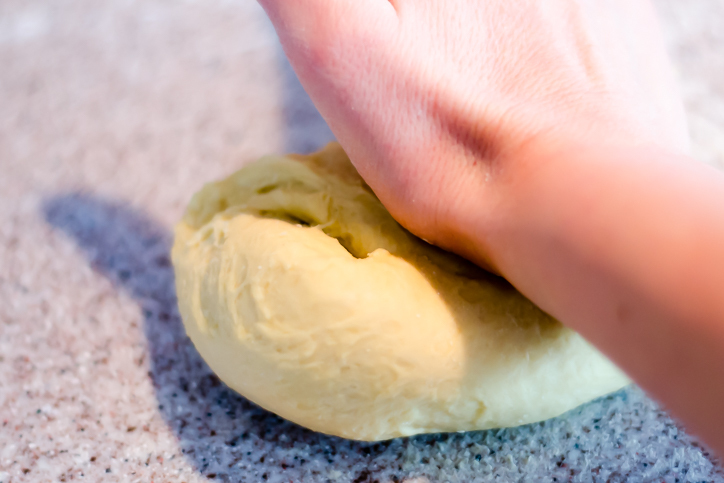 Begin kneading by pushing a segment of the dough away from you, flipping it back onto itself, making a quarter turn, and repeating. Knead in this way for about eight minutes, until the dough is smooth and somewhat elastic. When finished, slice the ball of dough into six equal pieces. 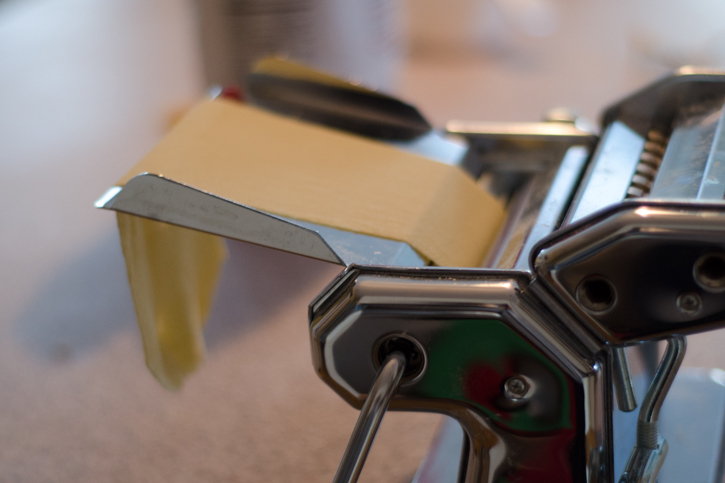 Roll out the pasta according to the directions on your machine, and set the tagliatelle aside. Place a 4 to 6-quart pot of cold water with 1 teaspoon salt on the stove over high heat. In a high-sided sauté pan over medium-low heat, add the olive oil and the onions. Sauté until the onions turn translucent and begin to soften, about five minutes. Add the wine or vermouth simmer until the scent of alcohol burns off, about two minutes. 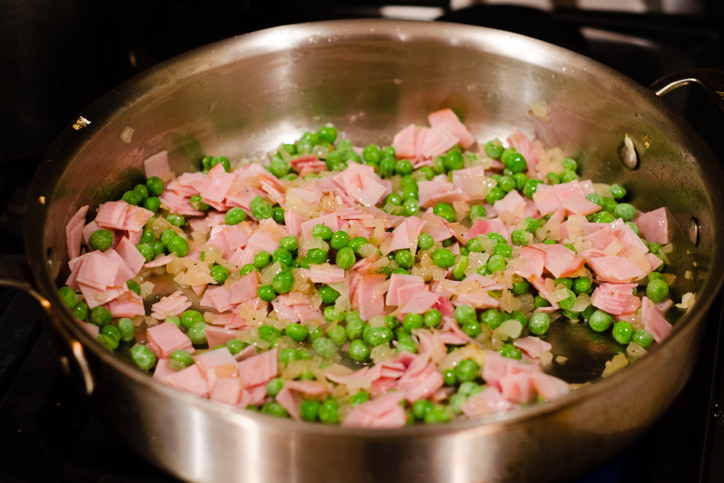 Add the ham and frozen peas and stir to combine. Add the cream and milk and a tiny pinch of nutmeg and reduce the heat to low. Simmer until the mixture thickens slightly, about three minutes. Add the cheese and stir to combine. Season to taste with salt and pepper. 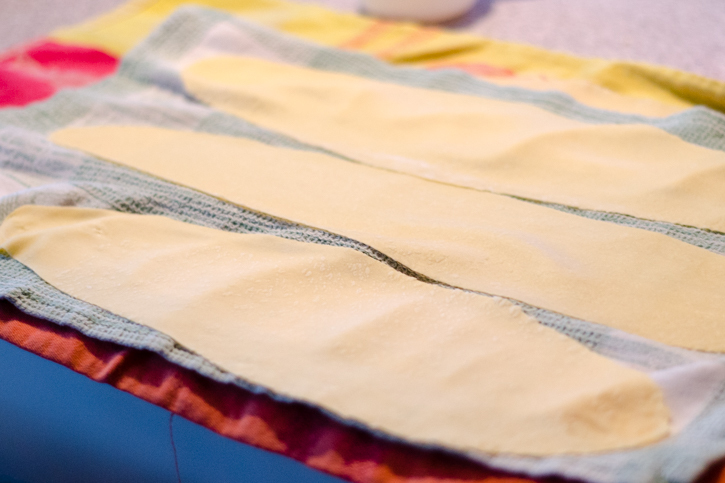 While the mixture thickens, add the pasta to the boiling, salted water. If using homemade, boil for about 4 minutes, until al dente. Otherwise, follow the package instructions. Drain the pasta, reserving one cup of pasta water. Once the sauce mixture has thickened, add cooked pasta and stir to combine. 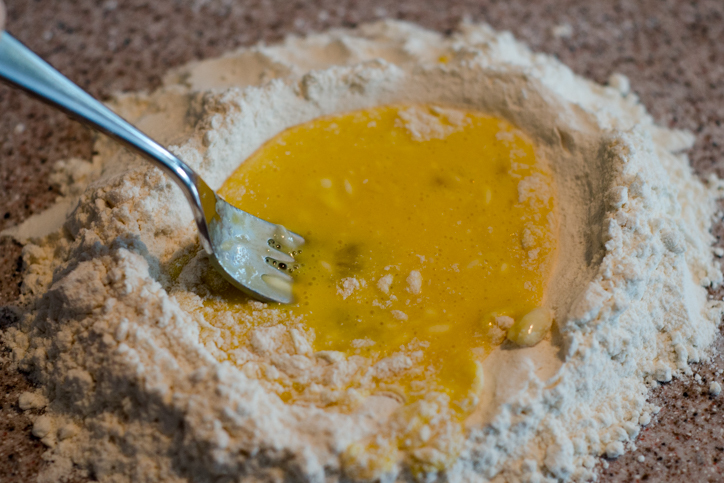 If the mixture seems dry and/or clumpy add some of the reserved pasta water, a few tablespoons at a time, until the sauce loosens up and evenly coats the pasta. Serve immediately, passing additional cheese at the table.